Kal Mansur’s Emblems are borne out of a love of painting and kinship with architecture. His art practice is a personal response to the experience of watching the destruction of the World Trade Centre towers while living in New York. The Emblems signal the fragility that is at the core of symbols of order and stability in contemporary society. 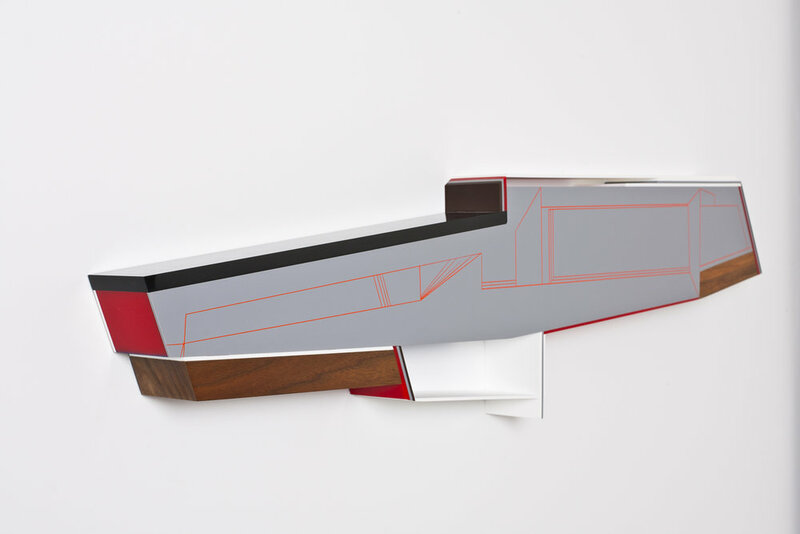 The Emblems are acrylic and walnut constructions that activate three key legacies from the 20th century: mass-production, the military-industrial complex, and architecture. Here we face objects that resemble hieroglyphs of a familiar past. One can imagine them as the contours of a modern building, the hull of a ship, the outline of a weapon. The angular lines and smooth finish evoke the impersonal feel of industry, yet retain a primal force that cannot be contained. The lines on the surface are not machine-made, but hand-carved. They arise from a loose, gestural approach that responds to the angles and proportions of the sculpture. These lines are a homage to the non-figurative traditions of Islamic art. They reference the geometric patterns often found in the great buildings of the Islamic world. Mansur’s artistic practice is aligned with the forces behind mass-production. He activates the idea of standardization upon the fine craftsmanship that belongs to the material arts, such as furniture making and high craft. The tools and materials used are readily available. Standardized construction presets, such as those found in a mitre saw, are employed to elicit recognition and familiarity. The Emblems exude memories of early modernist objects (Frank Lloyd Wright et. al). They activate a tension between the alien and the expected. The bodies of the sculptures are made from acrylic, a petroleum product. The prices of acrylic sheets vary from week to week, contingent upon the price of crude oil. Thus the Emblems are materially tied to the vicissitudes of the military industrial complex. They provide a serene response to the harrowing legacies of war and accumulation. Finally, Mansur takes cues from architecture. He converts, in his mind, “blueprint concepts” into material constructions. There are no preparatory drawings made. His process is intuitive and gestural, even if the end-result is a tightly woven combination of materials. Contrary to real building construction that divides space in order to create inhabitable voids, his constructions fill these voids with tactility. Mansur's voids are casts in waiting. They were never meant to be lived in but are to be preserved by being filled with substance and scaled down to the touch. (One cannot embrace a building or squeeze a thought, but one can hold his art.) His visions are immediately frozen right at the middle of birth. These embryonic visions— materialized, shrunk, compressed and sliced—are a preserved trace of a fleeting moment in an interminable search for perfection.